Please be advised, the Ministry of Forests, Lands, Natural Resource Operations and Rural Development will be replacing two bridge decks on the Bonanza Forest Service Road (FSR), which will intermittently close the road to all vehicular traffic. Works are scheduled to commence on Thursday, June 7, 2018. Anticipated completion is prior to Friday, June 22, 2018, subject to weather conditions. 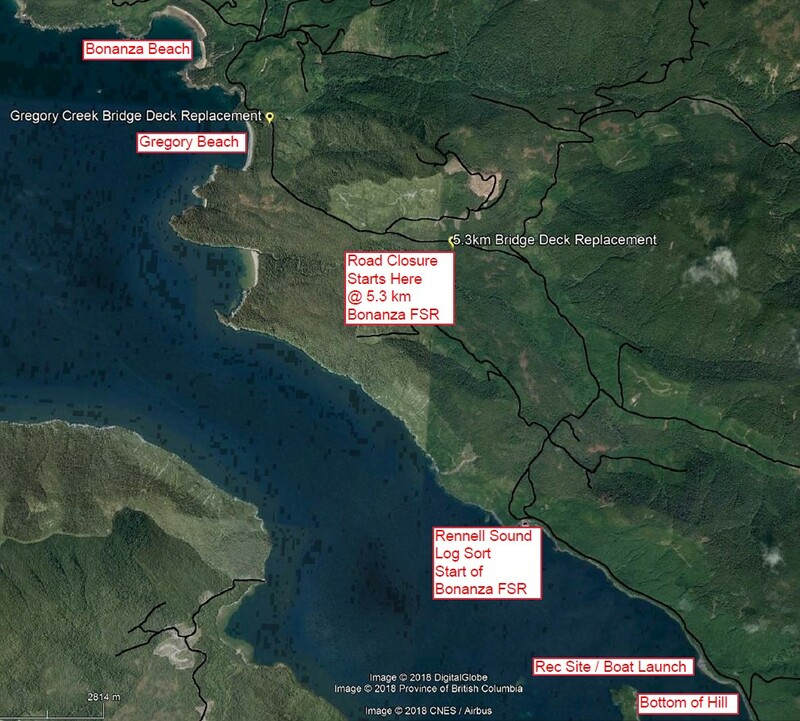 The bridge at 5.3 km (past the log sort) on the Bonanza FSR will be completed first, followed by the Gregory Creek bridge at 8 km. This page will be updated upon completion of works. It is strongly advised to not expect access during this period. Please plan accordingly. 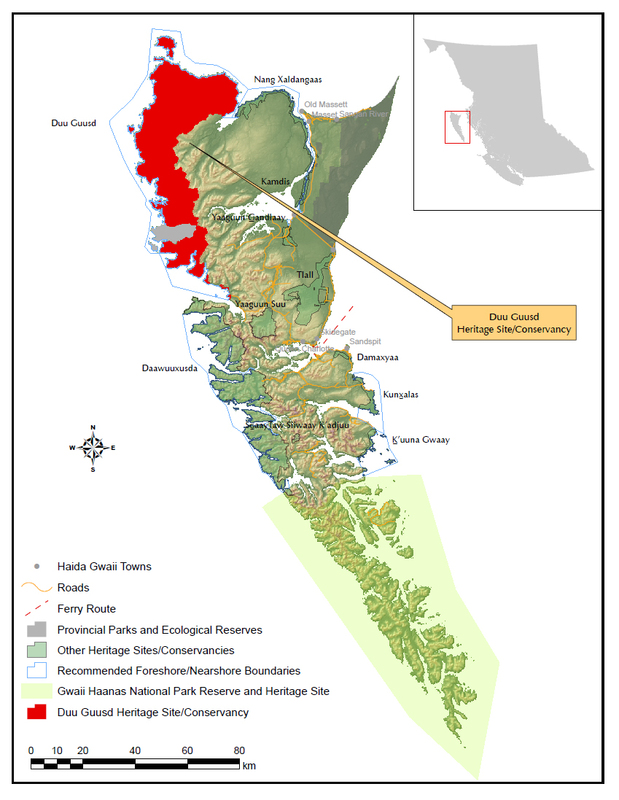 Duu Guusd Heritage Site/Conservancy is the only protected area on Haida Gwaii with a significant representation of all of Haida Gwaii’s three terrestrial physiographic ecosections (Windward Queen Charlotte Mountains, Skidegate Plateau and Queen Charlotte Lowlands). Some unusual geological features include Pillar Rock, Beehive Hill and Celestial Bluff. Naden Harbour and Henslung Cove on Langara Island are the centres for fishing lodge resorts and are popular destinations for guided and non-guided saltwater fishing vacations. The Rennell Sound area on the southern end of the heritage site/conservancy is the only west coast area on Graham Island that is accessible by vehicle and is a popular area for fishing. Note: This information is for the campground only. Park users can still walk into the park if conditions such as weather permit. Check the "Attention Visitor Notice" above for park alerts. Duu Guusd Heritage Site/Conservancy is located on the north-west corner of Graham Island, Haida Gwaii, about 30 kilometres west of the communities of Old Massett and Masset. It is part of an archipelago-wide system of protected areas that includes Gwaii Haanas National Park Reserve and Haida Heritage Site, several provincial parks and ecological reserves, and ten other heritage sites/conservancies. In total, half of the land base of Haida Gwaii is now in protected status. The terrestrial component of the heritage site/conservancy covers 143,593 hectares and extends from the western side of Naden Harbour along Dixon Entrance to Langara Island, and south along the Pacific Ocean coastline to Rennell Sound. The elevation range is from sea level to 865 metres. A marine component/foreshore area covers an area of 84,173 hectares. Duu Guusd Heritage Site/Conservancy is the only protected area on Haida Gwaii with a significant representation of all of Haida Gwaii’s three terrestrial physiographic ecosections (Windward Queen Charlotte Mountains, Skidegate Plateau and Queen Charlotte Lowlands). Some unusual geological features include Pillar Rock, Beehive Hill and Celestial Bluff. The basaltic formations and mountain ranges like the Cameron Range combined with very wet hypermaritime climate has led to extensive non-forested alpine and wetlands that often extend to the coast. There are 18 estuaries in the heritage site/conservancy that spill into some of the most productive marine habitat on Haida Gwaii. This coastline accounts for over 9% of the Herring spawning area (by length of coast) for Haida Gwaii, 35% of the occurrences of kelp forests, and significant eel grass beds. Duu Guusd Heritage Site/Conservancy contains 18% of Haida Gwaii’s fish-bearing freshwater, and streams such as Haines, Jalun and Coates are known to host coho salmon, chum salmon, pink salmon, sockeye salmon, Dolly Varden, steelhead, rainbow trout, cutthroat trout, stickleback, coastrange sculpin and slimy sculpin. The area hosts numerous listed species including 73 known Peregrine Falcon nest sites (red listed). Important nesting and foraging habitat can be found within this heritage site/conservancy for northern saw-whet owls (Riley Creek – blue listed), northern goshawks (Accipiter gentilis laingi – red listed), marbled murrelets (red listed), ancient murrelet (blue listed), and cassin’s auklet (blue listed). Eighty-eight recorded archaeological sites contain an impressive number of cultural items. These include at least 491 known culturally modified trees, shell middens, cobble tools, aboriginal logged trees, cambium stripped hemlock, lithics, cultural depressions, canoes, fire broken rock, habitation features, caves, human remains, smokehouses, cedar withes, rock shelters, house depressions, burial sites, burial boxes, burial houses, carved figures and planked trees. Many of these areas have not been inventoried thoroughly which indicates that the heritage site/conservancy likely contains many other unrecorded cultural heritage and archaeological sites. The cultural heritage values in the heritage site/conservancy include opportunities for the ongoing continuance of Haida culture through traditional use of the area. Some examples of traditional use within Duu Guusd Heritage Site/Conservancy may include monumental cedar and cedar bark harvesting, seaweed harvesting, medicinal plant harvesting, hunting, fishing, trapping and food gathering. The heritage site/conservancy also provides a place for the physical expression of culture through monumental art such as totems or establishment of traditional style infrastructure such as longhouses. The remote location of Duu Guusd Heritage Site/Conservancy provides an excellent opportunity to maintain biological diversity and natural environment values. Of concern, though, is the presence of introduced mammals of which raccoons, Norway rats and black-tailed deer pose a threat to local ecosystems. There is also occurrence of sowthistle, a non-native invasive plant, in the heritage site/conservancy. 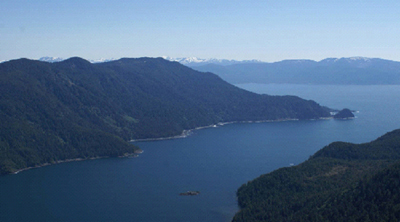 The management plan for Duu Guusd was approved in 2011 by both BC Parks and the Haida Nation.